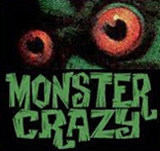 By 1961, the Monster Boom was in full swing, with all sorts of monster merchandizing flying off five and dime shelves. That year, Aurora released its now legendary Frankenstein model kit, and Charlton Publications jumped into the monster movie magazine sweepstakes with its twin titles, Horror Monsters and Mad Monsters, essentially the same magazine under two different logos. Charlton was a model of strict vertical integration, with editorial, layout, film, printing and distribution all under one roof at it’s sprawling, seven and a half acre plant in Connecticut. The company was able to churn out its magazines and comic books more cheaply than most any of its competitors. Further cost cutting was evidenced by the barest minimum of production values expended on the monster magazines. Monster Kids will remember the thin covers that scuffed easily and registered fingerprints, and the yellowish pulp interiors with typically dark and muddy photo reproduction. 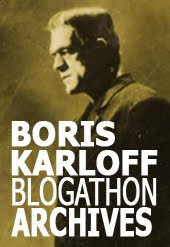 Nevertheless, Horror Monsters and Mad Monsters often were fun reads, straying into territory rarely visited by the reigning Famous Monsters of Filmland. For example, the issue at hand — Mad Monsters No. 5, from 1963 — carries articles on Face of Fire (1959), and the Mexican El Infierno de Frankenstein (aka: Orlak, The Hell of Frankenstein, 1960). Exactly who edited or wrote for these titles remains a mystery. Articles were never signed, and the editorial staff was anonymized with supposedly funny pen names (Abernathy Farquad, Editor, and Farquad Abernathy, Associate Editor). Today, Ed Konick is credited as editor, though his contribution was probably just putting the mags through the Charlton assembly line. Konick first joined Charlton in 1952 and served as General Manager from 1975 until the end, when the company folded in 1991. With the exception of a jazzy, buzzcut werewolf signed Steve Ditko on the cover of Mad Monsters number one, cover artists were never credited. Issue number 5 (1963), pictured here, features a bold design and a cool, colorful painting inspired by a promotional photo for Universal’s 1943 Frankenstein Meets The Wolfman. 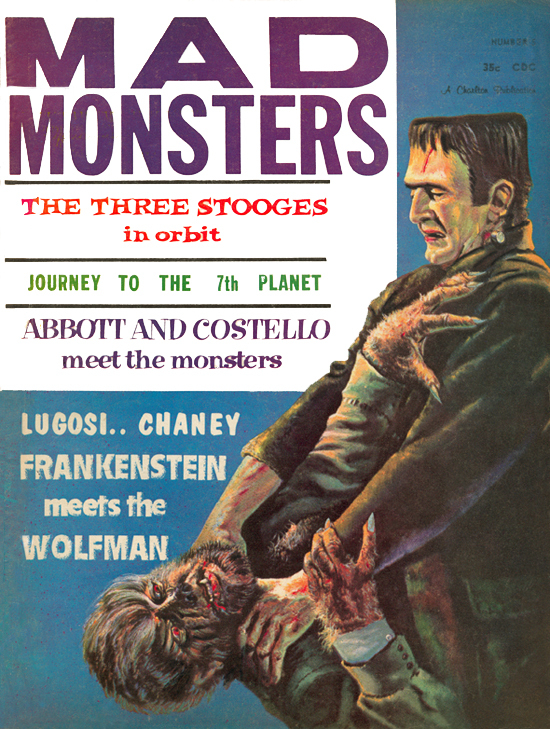 The Charlton titles were among the longest-lived of the Famous Monsters coattail riders, with 10 issues apiece between 1961 and 1965.
for a second, i thought that said "Mad Monsters meet The Three Stooges in Orbit" which is a movie i DEFINITELY would've wanted to see! Is this the same Charlton that put out the Blue Beetle comics, and the other titles that DC absorbed in the 1980s? Yes, B-Sol, same Charlton. Like its magazines, the comics were done in-house from a to z, from editorial, through production and all the way to distribution. Perhaps the most famous Charlton title was Hit Parader magazine, a legendary pop music publication that was unique in that they published the lyrics to current song hits. I NEVER knew Charlton put out Hit Parader. Man, talk about high school flashbacks. That magazine's still around, isn't it? I'm assuming someone else is publishing it now.